The Brother DCP 7065DN is an affordable laser multifunction printer designed for small to medium sized offices who requires fast printing skills. It features automatic duplex printing for producing two-sided output and a built-in ethernet interface for sharing resources over a network. The scanning feature in this device allows users to scan documents to a file, image, e-mail or an OCR. Using the high yield Brother DCP 7065DN toner cartridges can help lower your operating costs. This compact device weighs 25.13 lbs and measures 15.9 x 15.7 x 12.4 inches respectively. It has a well-organized control panel with different control buttons. It has a built-in ethernet network interface to share the resources over a network or connect locally to a single computer via its USB interface. It also supports a 35 sheet ADF to copy or scan multipage documents. The device has a 250-sheet capacity paper tray for letter or legal size paper and a single-sheet manual feed slot for bond paper, envelopes, labels, plain paper, recycled paper and thin paper. The printer is compatible with Mac and Windows operating systems. The printing resolution of this device is 2,400 x 600 dpi with print speed up to 27 ppm. The device also includes an ID copy feature which allows users to copy both sides of an ID card on a single page. The Brother DCP 7065DN is a compact and reliable monochrome laser multifunction printer that is perfect for home office or small office where space is limited. With print and copy speeds up to 27ppm, it allows users to stop wasting time and move on to other important tasks. It also supports automatic duplexing which helps in reducing the paper costs by printing on both sides of the paper. The high yield Brother DCP 7065DN toner cartridges increases the overall efficiency of the printer. Although, Brother DCP 7065DN is a multifunction device it lacks Wi-Fi connectivity, direct printing option, colour printing and fax facility feature which is found in almost all the other major multifunction printers lying in the same range. How to fix print quality issues in Brother DCP 7065DN printer? Once the process is completed, make a test print on the paper you inserted earlier. If still the printouts are not satisfactory, then we would recommend you to contact the Brother support. Q. Do you collect empty Brother DCP 7065DN toner cartridges? A. No, we don’t collect empty toner cartridges. Instead, we supply original and compatible toner cartridges and other printer consumables like paper. Q. What is your return policy for returning the defective Brother DCP 7065DN toner cartridges? Q. While using Brother DCP 7065DN printer, can I share resources over a network? A. Yes, definitely. A built-in ethernet network interface allows you to share the resources with multiple users on your network. Q. Which type of printing does the printer supports? A. The printer supports poster printing, watermark printing and N-up printing. Q. What is the print resolution and print speed of this printer? A. The print resolution of this printer is 2400 ✕ 600 dpi and the print speed is 27 ppm. Q. Can I take copies using this printer? If yes, what is the copying speed of this printer? A. Yes, the printer offers copy feature and the copying speed is upto 26 cpm. Q. Do you supply compatible Brother DCP 7065DN toner cartridges? Q. Which operating systems are compatible with Brother DCP 7065DN printer? A. The printer is compatible with Mac and Windows operating systems. Q. Is the printer suitable for large paper handling capacity? A. Although the printer supports duplex printing, it has limited paper handling capacity and lacks optional paper input tray. Q. I need to print documents in bulk on a regular basis. 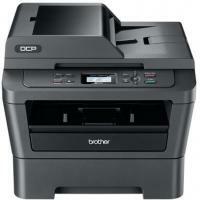 I recently bought the Brother DCP 7065DN printer. Will Brother DCP 7065DN toner cartridges give me a large output at reasonable costs or would you recommend some other toner cartridges? A. Brother DCP 7065DN black toner cartridges are perfect for printing in bulk as its toner is created for impeccable greyscales and smoother transitions that make black and white document and images appear superior. Q. Does the toner in Brother DCP 7065DN black toner cartridges adhere quickly to paper? A. Yes, it does, and that’s the reason why many people are opting for it. Q. Can I know whether installing compatible Brother DCP 7065DN toner cartridges invalidate the printer’s warranty? Do the sellers provide any deals and offers? A. Compatible cartridges won’t nullify your printer’s guarantee because they work as well as genuine ink cartridges do. Most sellers provide guarantee on purchase of these cartridges that include returns policy, 12-month guarantee, free shipping and more. Q. What should be done if toner from a cartridge happens to fall on clothes and skin? I’m planning to replace Brother DCP 7065DN toner cartridges, which I will be doing for the first time… Please help. Thanks. A. If toner is strewn on your clothes or skin anytime, you need to wash it off right away with cold water. Doing this will minimise the problem that contact with scattered toner can cause. Avoid using hot water to clean the affected area is it may lock the toner on your skin or into the fabric further, which will complicate matters. Q. How do I know whether toner cartridges are installed in the drum unit of my printer properly? A. When you set the toner cartridge back into the drum unit, you should hear it lock into place and the green lock lever should lift on its own. Q. Hi, I have a Brother DCP 7065DN printer. I have recently upgraded my Windows PC to Windows® 10 and now I can not Print, Scan or Fax from my PC. Can you help? A. When you upgrade your Windows PC to Windows® 10, you may not communicate with your device or use some features of the installed Drivers and Software. To resolve this issue you can simply uninstall and then reinstall the Drivers and Software to resolve this issue. Refer Brother user guide. Q. How would I know which unit is to be replaced between the Brother DCP 7065DN toner cartridge or drum unit for my Brother DCP 7055 printer? A. Your printer will advise you specifically about whichever unit needs to be replaced. If your printer advises to replace the Brother DCP 7065DN toner cartridge you need to replace the toner cartridge only and if it advises to replace drum unit you need to replace the drum unit only. It would be unusual that both units need to be replaced at the same time. Q. I own a Brother DCP 7065DN printer which has been connected to my iPhone. It was printing fine from my iPhone until yesterday and now when i am trying to print again there is an error message "No Supported Devices Found" appears on the Brother iPrint&Scan screen ( iPhone, iPod touch, iPad ). Please help! This issue can occur if you are using iOS7 in Ad-hoc mode. Update to iOS version 7.1 or greater to resolve the issue. Step 1: Confirm the settings of your Apple mobile device. Step 2: Confirm your printer is connected to the network. Step 3: Confirm the settings and connection of the wireless access point/router. Refer the Brother user guide to configure the settings and connections of both, the Apple device and the printer. Q. My Brother DCP 7065DN printer is displaying the error “Prepare New Toner Cartridge”. What does it mean? My printer is still printing quite okay, should I replace the Brother DCP 7065DN toner Cartridge? A. The error message Toner Low or Prepare New Toner Cartridge indicates that the Brother DCP 7065DN toner cartridge is approaching the end of its expected life, however the cartridge has not reached to its end yet. It is recommended that you continue using the Brother DCP 7065DN toner cartridge if the print quality is still good. The toner cartridge should be replaced only when the printer displays “Toner Ended” message or the print quality is no longer acceptable. However, it is a good idea to have a new Brother DCP 7065DN toner cartridge on hand and have it ready for when the Replace Toner status is indicated. Also, remember that the Brother DCP 7065DN has separate consumables the toner cartridge and the drum unit. Verify you replace only the Toner Cartridge and not the drum unit. To get instructions to replace your toner cartridge or the drum unit you can refer the Brother user manual.